Alas, the Humerus is not the Funny Bone. Tales from Learning Anatomy. 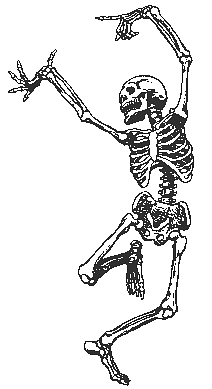 Perhaps I’ll jump for joy once I’ve learned the names of all these bones. So far in life, I have learned Hungarian, Spanish, a bit of French and, as a child, Hebrew. I have also picked up a bit of “Swimese” while participating in a Master’s swim program. For some reason my facility with other tongues is not translating easily into learning anatomy, which feels like a truly foreign language. At the outset of my Feldenkrais training last May, the educational director was careful to not slather the proceedings with anatomically exact verbiage. Such precision was not just unnecessary to the task of familiarizing us with the approach of the Feldenkrais Method and introducing the canon of Awareness Through Movement lessons, but might have also been counterproductive. It’s possible to notice marvelous if not miraculous shifts in one’s movement and sense of self while remaining clueless about the terminology for bones and muscles. Frankly, it was a relief to sense distinctions and differences without trying to pin them down with language, scientific or otherwise. Earlier this month I transferred to a different training program that began before my original one. My new educational directors and fellow trainees spoke with more anatomical precision more of the time. I became aware that I’d like to be able to speak more fluently and proficiently about the body, too. That I’ve had a longstanding aversion to anatomically precise vocabulary doesn’t help. My resistance has to do with how such words and professional jargon can be used by medical professionals to maintain hierarchy and also create a distance if not a barrier between the doctor and the patient and between the patient and the cause of their symptoms. If the doctor is more focused on finding a diagnosis or coming across as an expert than on connecting with the human (partly by using lay language), the patient may leave feeling invisible, alienated or worse than when they made the appointment, even if they now know what the “problem” is. Practitioners of the Feldenkrais Method facilitate healing without diagnosing (think about that for a moment!) by treating the person in front of them as a whole human, not a collection of parts, and investigating how that particular human moves and organizes him or herself. This investigation is done with curiosity and without a foregone conclusion: no formulas, protocols, boxes to check or labels to affix. In my Feldenkrais world, which privileges process over results, I don’t want to revive my familiar learning strategies of flashcards, memorization marathons and competitiveness that I relied on to score high on SATs and GREs and also learn those other languages. Granted, in my 20s it was exhilarating and empowering to blow through nearly the entire curriculum of a Spanish language school in Quito, Ecuador in four weeks while refusing to speak a word of English, an approach no one else followed. I’m also aware of my habit to compare myself to others or be motivated by a desire to win or fear of being left behind, so I’m challenging myself to go about this project differently. Can I apply a similar kind of open ended curiosity to learning anatomy, rather than freighting it with familiar pressure? At my new training in San Francisco, I tried to listen with a relaxed ear and brain, as if I were traveling abroad and overhearing local chit chat, rather than allowing my resistance to shut out the words or permitting my inner critic to berate me for not knowing “enough” yet. I heard a few terms repeated multiple times: humerus and radius and ulna, the bones of the arm. I gently jotted them in my notebook, rather than bearing down insistently and urgently with the pen. I noted that humerus rhymes with humorous yet, alas, is not the funny bone (which isn’t a bone at all, but the ulnar nerve. Oy!). I didn’t rush to purchase the biggest and best book on anatomy, as I would have done pre-Feldenkrais. While wandering in the city, I came across an illustrated paperback, Atlas of the Human Body, in a used bookstore near Market Street. Being a fan of serendipity, I bought it as a gentle gateway. I can flip it open, peruse and learn by osmosis rather than overdoing. I’m allowing my mind to play with these words, whether brand new or vaguely familiar, rather than force feeding it new vocabulary. For instance the scapula, otherwise known as the shoulder blade, sounds a bit like spatula, both of which have a scooping quality. It connects the unfunny humerus (upper arm bone) to the clavicle (collar bone), which both sounds like popsicle and looks like one turned on its side. Jumping down to the leg, the patella (knee cap) is just one letter away from paella, and its shape mildly resembles that of a paella pan. Now my stomach is growling, so I am going to pause today’s lesson and give my mandible (rhymes with edible) something to chew on. Hello Ilona, how wonderful to un-train your mind in order to learn differently. It sounds fun, and liberating. I hope that you enjoy the process. A tiny detail, but I could not help shuddering at the sight of the extraneous apostrophe that made its way into your penultimate sentence.